The name Rhymesayers doesn’t appear on the tape artwork. It’s really a DJ Mixtape with a collection of Hip Hop joints from the 80s and 90s. Sprinkled in thru out the tape are freestyles from the Headshots Crew. It’s themed out as a live radio show, but it was all recorded down in S.T.R.E.S.S’s a.k.a Siddiq (Rhymesayers CEO) basement, as all the Headshots Tapes and many early Rhymesayers releases were. Side A is mixed by Eklipz, who was also an MC in the Abstract Pack. Eklipz keeps it clean and simple with smooth blends and some flavorful cuts added here and there. Side A features freestyles from Knowledge MC & Glo, both from the Abstract Pack. Towards the end of his side, there’s a cool little mini-mix with a variety of mid 90s classic beats, which leads nicely into a Beat Blend Remix of The Lixx featuring Diamond D “The Next Level”. Side B is credited to being mixed by Slugo, who of course you know better as Slug of Atmosphere. He’s blends are on point and his song selection and rather unlikely pairings are a great glimpse into his creative blend of styles that also transferred to his mic skills. You’ll hear Biz Markie mixed into Aceyalone, or the Chubb Rock into The Artifacts…both made me pause and nod my head in appreciation. The Slug side features freestyles by Beyond, Eklipz of Abstract Pack, and Slug himself. 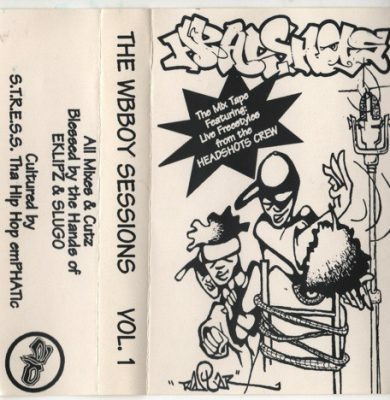 comment "Headshots – The WBBOY Sessions Vol.1 (Cassette) (1995) (320 kbps)"